The Notegraphy iPhone, iPod Touch, and iPad app is a fun, engaging tool to create Pinterest-worthy memes, intriguing journal entries, and social network for word lovers. It incorporates inspired, chic, and well-crafted graphics to accentuate the words you type. You may share your Notegraphy note to promote your business on Twitter, or you store it privately as a beautiful journal entry. The intuitive quality of this thoughtfully designed iOS app will delight, and you will be shocked to find out it is a free iTunes App Store download. To establish an account, you can authorize with Twitter or Facebook, or you can create an account with email. The Facebook authorization requires access to your basic profile and list of friends. If you choose to share with an existing social network, your authorization will be required at the time of the share. 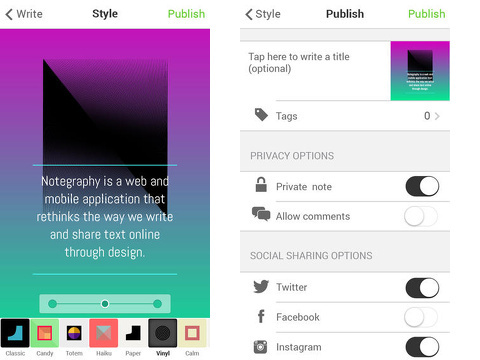 The Notegraphy iPhone app is also a web app. The Notegraphy iPhone app is introduced nicely with several slides scrolled with horizontal swipes, but they can easily be skipped. The interface and process is so smooth and simple. You open to a blank screen, and you start typing. You can add additional pages by touching the lower right corner of the screen. When you complete your copy, you move to the next screen to select the graphic design to complement your text. The graphics are created by artists and are carefully curated. There are currently 25 graphic styles with wit, punch, and sophistication. I find the Peak style exciting. The first letter of your first word is transformed into a rugged mountain range. For each graphic theme, you can choose from three different color combinations. 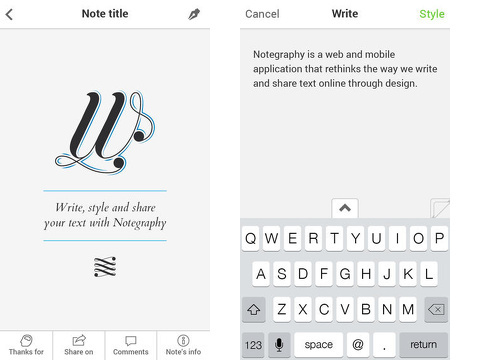 You add the final details to your Notegraphy iPhone app note with a final sharing-style screen. Most of the options have gesture-controlled, on-off buttons similar to iOS alarm clock interface. All of the settings can be customized and include title, tags, make private, allow comments, and save to photos. You can also share to Twitter, Facebook, Instagram, and Tumblr. Your Notegraphy iPhone app profile helps you keep up with your notes. You can manipulate the profile’s screen by selecting from three views – large thumbnail, matrix, or list. You can also sort your notes by published, draft, and featured. The Notegraphy iPhone app social network is accessed through a sliding left menu. You explore notes shared and share your appreciation for a note – a la BuzzFeed – with one of the following sentiments: smile, inspiration, laugh, story, mindtrip, help, and feelings. The Notegraphy iPhone, iPod Touch, and iPad app’s strength is in its fantastic interface for creating a visually-engaging note. The social network is a nice addition, but it is certainly an exciting tool for enhancing your current social networks. AppSafari review of Notegraphy was written by Jenni Ward on November 13th, 2013 and categorized under App Store, Enterprise, Free, Fun, iPad apps, Notes, Productivity, Social, Universal. Page viewed 4698 times, 2 so far today. Need help on using these apps? Please read the Help Page.